Software control over analogue modular synths takes a big step forward, as Expert Sleepers' growing plug-in suite is joined by custom hardware. The Step LFO plug-in combines some of the attributes of an LFO and a step sequencer, to interesting effect. The analogue modular synthesizer has seen something of a revival in modern times, with enthusiast, DIY and supplier web sites in profusion — and for good reasons. It's hard to deny that turning the filter cutoff control on a real synth is a more visceral and satisfying experience than clicking and dragging a screen graphic. A fully fledged modular synth can be very expressive, but exploiting its potential in performance may be a difficult process. For controlling a modular in real time, it can help greatly to have a computer available. All the patch cables and spare hands in the studio won't help when what you want is a DAW tempo-sync'ed LFO. 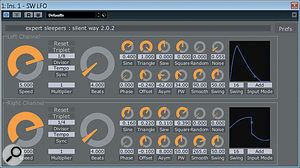 Back in SOS May 2010 (/sos/may10/articles/silentway.htm), I reviewed Expert Sleepers' Silent Way, a suite of VST/AU plug-ins designed to produce control voltages that can be used to sequence anything from a simple monosynth to a modular behemoth. My experience with Silent Way was very positive, but if there was a significant 'catch', it was the system's reliance on a compatible audio interface. The interface needed to be one of the minority with line outputs that are 'DC coupled' (in other words, capable of maintaining a DC voltage), and this restriction made it something of a problem for those of us whose interfaces didn't make it onto the compatibility list. Expert Sleepers did discover a way to make Silent Way work with quite a few non-DC-coupled interfaces, by way of a special adaptor cable, but have now taken things a major step further by releasing their own collection of hardware modules, as well as a new and updated version of the plug-in suite. The problem of dependence on DC-coupled audio outputs has been solved by the development of a number of hardware modules in Eurorack format, ready to slot directly into your modular rig.Along with the new version of Silent Way, I was also provided with four of these new Expert Sleepers hardware modules — the ES3, ES5, ESX8GT and ESX4CV — and their MIDI and DIN Sync adaptor cables. The modules are in the popular Eurorack format, and require a compatible housing and suitable power supply. The idea of adding these mod ules to a Eurorack-based modular synth system is a very neat one, bringing the control voltages to where they are needed with the minimum of external wiring. For the purposes of this review, the hardware modules were housed in a Doepfer MiniCase, with attendant PSU. All that was needed was a single ADAT optical cable between my existing RME Fireface 800 audio interface and the ES3 module. There are many, many options for combining and configuring a system based on Expert Sleepers hardware, and you can look on their web site for detailed information. The ES3 on its own is capable of delivering eight separate CV outputs of about ±10V, while the other hardware modules connect to header sockets on the ES3 circuit board. For the purposes of this review, the ES5 was logically attached to channels 7/8 of the ES3, providing eight 5V gate outputs which can also be used for MIDI or DIN Sync. The ESX8GT was attached to channel two of the ES5, adding another eight 5V gates (a jumper allows these to be set to generate 12V instead). The ESX4CV was attached to channel three of the ES5, giving four channels of ±5.3V control voltages, hardware calibrated for V/octave operation and ostensibly removing the need to calibrate the V/octave setting via the Silent Way Voice Controller. In practice, I found I could get slightly better tracking for a couple of my synths by going through the calibration procedure regardless, but I know this to be a feature of these particular synths that are not perfectly aligned. My Minimoog, for example, seems to be happier at around 1.1V per octave. The Voice Controller plug-in is still the centrepiece of Silent Way, whether you use it with a generic audio interface or with Expert Sleepers' own hardware. Since my last look at Silent Way, the number of plug-ins included in the suite has grown considerably. There are now 18, some of which are specifically designed to provide support for Expert Sleepers' hardware modules. The full list now comprises Silent Way AC Encoder, CV Input, CV To MIDI, CV To OSC, DC, ES4 Controller, ES5 Controller, ESX4CV Combiner, Follower, Learner, LFO, Quantizer, SMUX, Soundplane, Step LFO, Sync, Trigger and Voice Controller. Both 32- and 64-bit platforms are supported on Mac and Windows, and a piece of licence-control software is required to register and activate Silent Way. This allows installation on up to three computers, and installation and registration are quick and simple. All of the plug-ins I previously covered are still included in the package, but have been refined and enhanced in various ways. A 'Prefs' button has also been added, containing a handful of options, including the ability to choose alternative 'skins' for the plug-ins. 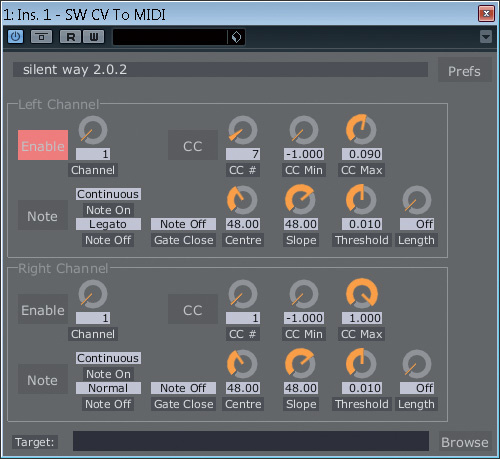 Adding a Silent Way plug-in as is simple as inserting it into an audio track. The format of the audio track is important, since it defines the number of inputs and outputs that the plug-in can access. Voice Controller, for example, can output up to six CV signals. Adjusting the plug-in controls is simple enough, but I found that the small knobs could be fiddly, and resorted to holding down the Shift key (for finer adjustment) more than I would have liked: for instance, all of the control I wanted to use under the portamento knob in Voice Controller seemed to be within the first tiny fraction of movement. I was also a bit miffed to find that the shortcut to reset a control back to default is Alt-click in the Windows version, whereas most other software I own seems to use Ctrl-click. This caught me out many times and became quite tiresome. After I pointed it out to Expert Sleepers, they suggested that it may become a user option in future. Double-clicking may also be used to restore a control to its default value. On the plus side, the value display at the top of the window is a great feature, helping to confirm which control you are hovering over and the value to which it is set. It's a small thing, but it makes a big difference. Tutorial videos are plentiful and Expert Sleepers manage a forum for their users, so no-one should ever be stuck for long. If you hit a problem that isn't covered in the manual, or doesn't make sense to you, it's good to know that other help options are available. The LFO plug-in goes well beyond what most analogue LFO modules are capable of! DC: This is the simplest of the plug-ins from the user's point of view, and a good starting point. DC produces constant output CVs, and is therefore a good way to check that your connections are working properly. Since DC's controls can be automated from most DAWs, it also permits CVs to be sourced from controller information, such as a breath controller, or a drawn LFO wave-shape. I had some fun sending modulation data from my JP8080's vocoder and using this to generate filter CVs. I can't say I achieved anything beautifully musical, but the resulting odd, burbling effect I recorded may come in handy some time! Voice Controller: In its simplest sense, Voice Controller provides a comprehensive MIDI/CV converter, capable of generating six independent control voltages related to gate, trigger, pitch and up to three envelope generators. A clever matrix system allows any of these CVs to be mixed at any level to any, or all, of Voice Controller's six outputs. Highest, lowest and newest note priorities can be selected, as can envelope re-triggering when a new note is detected. Portamento is offered in a variety of guises, including auto and fingered (legato), thankfully at both constant rate and constant time. The shape of the portamento curve is also variable. Very nice! Specific hardware control is offered for both the ES4 and ESX4CV modules, making setup simple if you have either of these. Trigger: Expert Sleepers describe Trigger as a cut-down version of Voice Controller. It serves to generate a gate or envelope CV when triggered from an incoming MIDI note or trigger CV. LFO: This plug-in generates one or two channels of low-frequency oscillator control voltages. It is very simple to get standard vibrato, tremolo and wah-wah effects from LFO, but that's really only the start of this plug-in's talents. All sorts of synchronisation options are on offer, from simple tempo-locked and divided waveforms to swing patterns and variable offset or asymmetry between the two channels. A healthy variety of waveforms is on offer, including the usual sine, triangle, saw and square waves, but also stretching to random and noise waves, all of which are freely mixable into the output CV. LFO is a useful plug-in to insert after Voice Controller, where LFO will combine its CV with any of Voice Controller's outgoing CVs before it is sent to the outside world. Step LFO: This interesting plug-in is like a halfway house between an LFO and a step sequencer. It shares many of the LFO plug-in's features, including Smoothing, Speed, Sync, Swing, Input Mode, Asymmetry, Phase and Offset, but effectively empowers the user to create his or her own LFO 'waveform' over a number of steps, with interpolation between steps, if required. If you want to resolve its output voltages to guaranteed musical intervals, you'll need to employ the Quantizer plug-in as well. Rather than program drum sequences over MIDI, many people prefer to use their drum machines' onboard sequencers and sync them via a clock signal. Expert Sleepers' Sync plug-in makes this possible. 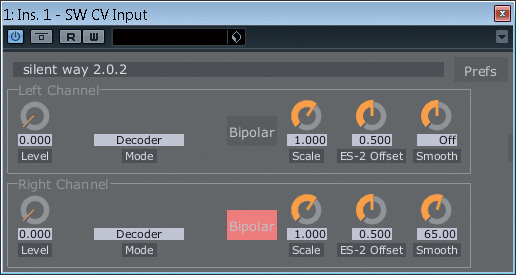 CV Input: The new version of this plug-in adds support for Expert Sleepers' ES2 interface, which simplifies connection and use. Otherwise, it is still much as it was, and worked fine with my own audio interface, despite being a little more complex to set up. This is a great way to record external analogue control sources into your DAW. What it essentially does is convert a control CV into a recordable piece of audio that then can be used to drive a control CV output. Clever, and extremely useful. CV To MIDI: This plug-in is new to me, and it's already become a firm favourite. What it does is to create MIDI output from CV signals. Not so exciting, you may think, but it is very liberating to have control of a digital synth's filter cutoff (for example) from the knob, or modulation sources, of an analogue synth — which is possible when this is combined with the CV Input plug-in. 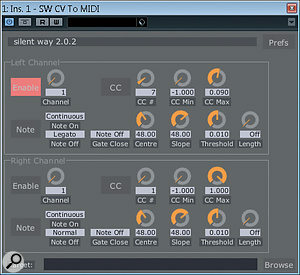 CV To OSC: OSC stands for Open Sound Control, and this plug-in allows incoming CV signals to be turned into OSC messages. OSC is not for the faint-hearted, but it opens the door into a world of connectivity that includes Web interfaces, networked audio devices, and even iOS. Follower: If there is one musical pastime that fills me with joy, it is allowing a little chaos to work its magic into my music. Follower fits the bill nicely, since it tracks the pitch and envelope of an incoming audio signal and derives control voltages from the result. I had great fun throwing all kinds of odd sounds at Follower and hearing what my synths made of the resulting CVs. I got some very useful rhythmic synth patterns from deriving amp and filter CVs from drum patterns, and spent a merry half-hour scratching the grille of a microphone to send pitch CVs into a sync'ed oscillator. OK, it may be strange, but it's legal in Yorkshire! Quantizer: This is a plug-in I never knew I needed — until I tried it. Its function is to quantise incoming CV signals to a finite series of values. These values could be a musical scale, such as G-minor, or semitone steps. It's also useful for deliberately adding 'zipper noise' to an otherwise smoothly moving CV, which is an effect I particularly like. Sync: The function of this plug-in is to generate DIN Sync/clock signals to synchronise drum machines, synths and sequencers with your DAW. There are discussions all over the Internet about the merits of running classic drum machines from a clock signal, as opposed to triggering their sounds from MIDI input, not least since their programming interfaces are still a large part of their appeal, and Sync may win many fans for this reason alone. Roland-friendly 24ppqn (pulses per quarter note) and Korg-friendly 48ppqn quick presets are available, but the ppqn value can be specified as anything up to 96. Multiplier and Divisor controls are also provided. It's fair to say that achieving reliable synchronisation with clock pulses can be a mystic art, and I recall long hours back in the day of trying to bully devices (sometimes even from the same manufacturer!) into locking together reliably. Sync provides a number of tools for avoiding any such troubles, including the ability to alter the voltages of the clock's high and low states, change the trigger length and delay the first clock signal — which is recommended for DIN Sync operation. A Swing control is a useful addition for drum machines or sequencers that lack this feature. When Sync is used with an ES4 hardware module, Sync plug-ins can be stacked to generate multiple clock outputs. It's not all one-way traffic: the CV Input and CV To MIDI plug-ins let you use analogue sources as controllers within your DAW. Learner: It can be tricky to keep track of routings once a few Silent Way plug-ins are instantiated. Learner helps to pull MIDI and OSC communication into one place. It acts as a hub for incoming messages and routes the messages to any Silent Way plug-in by way of a Unique Identifier. True to its name, Learner has the ability to 'learn' a MIDI Controller (CC) input and assign this to a specific control in any Silent Way plug-in. Learner also enables OSC messages to control any plug-in parameter, opening up the possibility of creating, for example, an iPad control panel, given the right combination of software and operator skills. AC Encoder: This is a plug-in aimed at removing Silent Way's exclusive dependency on DC-coupled devices. In essence, AC Encoder is placed at the end of the chain after other modules, and serves to convert the outgoing signal to a form that can be used by practically any interface. It does this by way of special cabling, which is purportedly simple to construct for yourself, if you have basic soldering skills. Alternatively, you can use Expert Sleepers' ES1 hardware interface module. 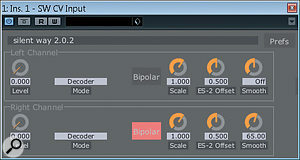 Two- and six-channel AC Encoder plug-in versions are provided in the suite. Although the vendors say that it was "exciting and empowering to free people from the DC-coupled restriction at the time”, with the increased spare digital connectivity that most people enjoy these days, the ES3 and ES4 digital interfaces are likely to provide a better solution for most. ES4/ES5/ESX4CV Controller: These hardware-dependent plug-ins exist solely to provide control of the ES4, ES5 and ESX4CV interfaces respectively. The ES4 interface produces five CV outputs from a standard S/PDIF digital output, providing what is, in essence a two-channel MIDI-to-CV interface, complete with velocity information. The interface is even capable of delivering clock pulses derived from the host DAW. I didn't have an ES4 to test for this review, so I can't comment on its operation. 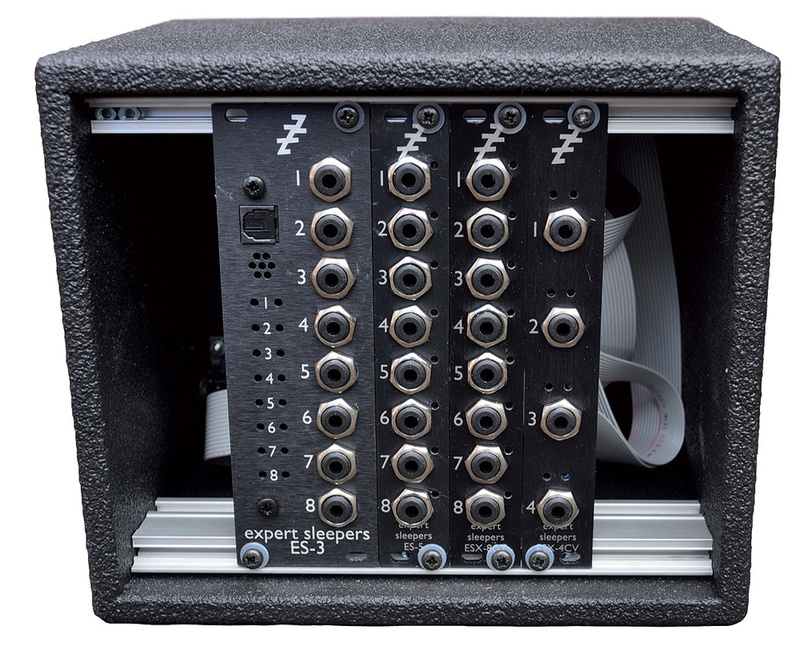 The ES5 module piggybacks on the ES3 Lightpipe interface, and shares one of the ES3's stereo channels to provide up to eight gate, clock, sync or MIDI outputs. The ESX4CV module is another expander for the ES4 and ES5 modules, providing four CV outputs from one of the expansion header connectors. 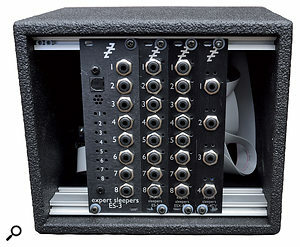 Up to six expansion modules will connect to headers on the ES5, making for one heck of an interfacing matrix. You could, for instance, attach six ESX4CVs for the maximum number of CV outputs (though doing this would render the ES5's own outputs redundant). Soundplane: This plug-in is designed to function with Madrona Labs' Soundplane control surface. At this point, I can only refer you to the web site (http://madronalabs.com), but a quick view of the video examples on there certainly whetted my appetite to find out more. SMUX: When audio interfaces are run at 88.1 or 96 kHz, the number of available ADAT channels is halved. Expert Sleepers have recognised that this reduces the number of CV channels that can be sent via ADAT. A solution is provided in the form of the SMUX plug-in, which cleverly ensures that four CV signals coming into SMUX will arrive as four CV channels out of their ES3 interface running at 44.1/48 kHz. Neat. Voice Controller is still my favourite plug-in of the suite, and I spent considerable time using it to coax several of my old analogue synths into life. While calibrating Voice Controller to my Minimoog I discovered that you are now given the option of saving and viewing the pitch-table text file created by the calibration process. This also means that you have the potential to edit it. Not only is this useful for ironing out any pitching anomalies (although I found that the automated process did a clean enough job with all of my synths), but with some mathematical prowess you could create custom tuning patterns, or simply make the pitch map display look nice and neat. Better still, it is now possible to save and load calibration tables, although it would be nice if the currently loaded table was named under the map display — I found myself frequently forgetting which synth's instance I was looking at! One slight disappointment, for me, was that Voice Controller, although responsive to MIDI pitch-bend messages, did not respond to MIDI modulation messages, to let me add LFO to the pitch voltage. This could be achieved by using Silent Way's Learner plug-in, having it assign MIDI Controller #1 to Voice Controller's LFO Depth, or by similarly using an instance of the LFO plug-in. I got around the problem by assigning a Cubase Quick Control to Voice Controller's LFO Pitch Depth knob (and I'm sure most DAWs will allow something similar), but I feel it would be much better if Voice Controller handled this itself. I also found that using Voice Controller's portamento sometimes resulted in me losing pitch voltage, but in the grand tradition of bug-fixing activities, switching portamento off and on seemed to cure it. The breadth of possibilities offered by Silent Way is so huge I can't hope to cover all its applications here, and there is so much scope that I'll admit it can be daunting at times. I'm sure every user will find his or her own ways of employing these plug-ins, and I'll describe a few of the highlights I encountered in my testing. First, placing Voice Controller in polyphonic mode, I managed to create some monster poly-portamento pad sweeps on my Oberheim Xpander. For a while I was unable to get more than two simultaneous CVs to be output, but a restart of Cubase seemed to cure the issue and I didn't encounter it again. Moving on to other plug-ins, I placed Quantizer after an instance of LFO and fell in love with the 'stepped' and 'zippered' pitch sweeps I could create: superb for ear-catching breaks and techno sound effects. Likewise, I found Step LFO (coupled with Quantizer) great fun as a step sequencer. Coupled with some hardware faders, it makes for a great performance tool. After drafting in a couple of old drum machines, including a Roland TR808 and TR909 and a Casio RZ1, I tried out a few of Silent Way's synchronisation options, using both the DIN Sync and MIDI clock options, and the special adaptor cables. The outcome was very successful, and it wasn't long before a few happy accidents with sync rates had me capturing some inspiring off-the-wall patterns for later use. The old RZ1 seemed to lag behind the clock a little, but there were sufficient options in Silent Way to let me create suitable offsets to achieve good timing. A major advantage of the MIDI clock generated by Silent Way is its accuracy and stability, in contrast to that available from a standard USB or Firewire MIDI interface. This should please those who like to layer and mix their drum patterns. Silent Way is still dependent on your audio interface's latency, so the lower you can make this, the better. The control voltages generated by the software are, however, sample-accurate, and I found the sense of 'connection' with my old synths tangibly better when playing them in real time using Silent Way, as opposed to through my MIDI interface and a MIDI-to-CV converter. A few recordings proved that the synths were much quicker to respond and more consistent in timing. I typically have to audio-quantise analogue bass sequences to get them as tight as I like, but those generated by Silent Way needed no quantisation to feel solidly nailed to the beat. Silent Way is well past the acorn stage now, and on its way to becoming a substantial oak. The hardware modules effectively address the shortcomings of Silent Way's dependence on DC-coupled audio interfaces, and the ES3, in particular, will be welcome for anyone interested in Silent Way who has an ADAT output going spare on their audio interface. Happily, other than the minor glitches noted above, I didn't happen upon any serious bugs. Expert Sleepers do seem very open to bug reports and suggestions from users, so confirmed problems have a good chance of being fixed promptly. I can't think of much I don't like about Silent Way. For the money, there's really nothing else that can provide such an extensive amount of CV control in such an integrated package. For anyone with a modular synth system of any complexity, and ambitions to put it to work alongside a DAW, Silent Way simply has to be a serious consideration. 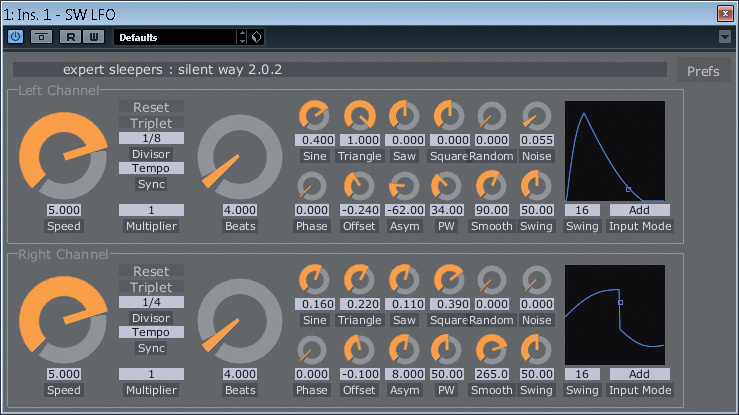 For those such as me, with a collection of more modest monosynths, Silent Way really is a viable alternative to a MIDI/CV interface. The sample-accurate timing is a big plus and there's a degree of control here far in excess of any other dedicated device I've seen to date. The only serious alternative to Silent Way is MOTU's Volta system. However, this is Mac-only, and, as it's purely a software system, still requires a DC-coupled audio interface (such as one of MOTU's own units). Mac OS X: Silent Way requires at least Mac OS 10.5.8. The plug-in is Intel-only, and built for both 32- and 64-bit platforms. The Audio Unit version will work in any Audio Unit host. The VST version requires a VST 2.4-compatible host. Windows: Silent Way has been developed and tested with Windows XP SP2 and Windows 7. It may work with other versions of Windows (Vista included), but this is not guaranteed. The plug-ins require a VST 2.4-compatible host. MIDI adaptor for ES5/ESX8GT: £4.80$9. DIN Sync adaptor for ES5/ESX8GT: £5.52$10. New hardware modules remove dependency on DC-coupling and open up many connection options. Brings genuine analogue synth control right into the heart of the modern DAW. Sophisticated generation of control voltages, with plenty of modulation options. Tight, sample-accurate triggering and MIDI/DIN Sync clock signals. The choice of hardware options and initial setup can be complex. Susceptible to your system's latency. Requires considerable spare audio output capacity. If your audio interface has a spare ADAT port, or if your audio interface is DC-coupled and you have sufficient spare I/O, Silent Way is a powerful and accurate way of integrating synths, sequencers, drum machines and other goodies into your recording system. Getting started can be complex, but the rewards are immense and well worth negotiating the learning curve for. Scan 3XS i7 PC with 6GB RAM, running Windows 7 64-bit. Tested with MOTU 828 MkII audio interface and Steinberg Cubase 6.5.4.